The debates marked the twentieth anniversary of the Amsterdam Treaty and of the adoption of the Tampere Programme. Officials reaffirmed the need to maintain the essential principles of judicial cooperation in civil and commercial matters: focusing on the citizen; facilitating access to justice; respect of the EU common values, of the rule of law and of the fundamental human rights and freedoms, the protection of legal traditions and of the member states’ various legal systems; the strengthening of mutual trust in the member states’ judicial systems. The main objective of this working session was to start a reflection process about the further development of judicial cooperation in civil and commercial matters after the end of the European Parliament term in May 2019 and the end of the European Commission term in October 2019. The ministers assessed two possibile ways of future action: (a) – analysing how the existing legal framework can be improved; (b) – new topics to which European law can be applied. The participants concluded that, considering the complexity of the already existing legislation, a special emphasis should be put on improving and implementing it. Proposals were made to extend regulation into new domains – either originating from existing provisions, or concerning topical issues such as digitalisation. 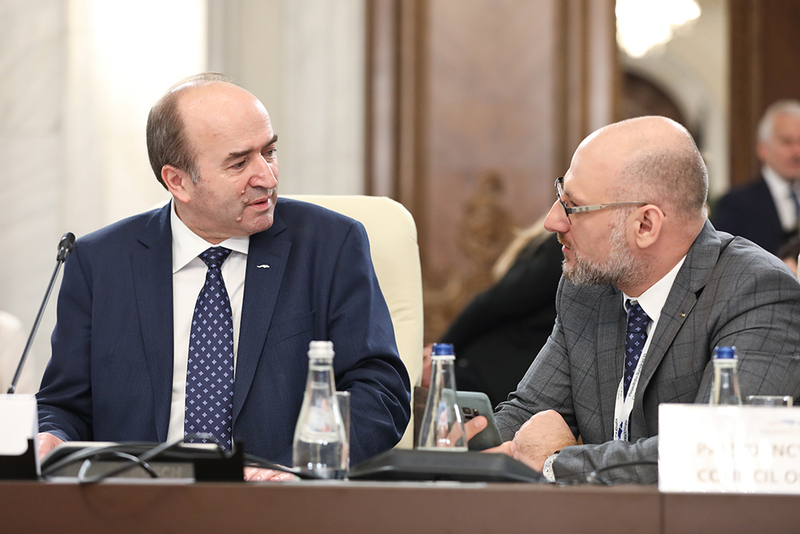 In this regard, Romanian Minister of Justice Tudorel TOADER highlighted that ”the future of EU policies must centre on the citizen”. Today, the EU has a strong and comprehensive legal framework for judicial cooperation in criminal matters. Moreover, the legal instruments giving effect to the principle of mutual recognition of judicial decisions are at the core of this legal framework. In this context, ministers discussed: the legal inconsistencies within the actual framework of mutual recognition instruments, the actions to be taken under the case law of the Court of Justice of the European Union, digitalisation. To reach the aforementioned result, the ministers concluded that the current legal framework should be evaluated and, where necessary, take new EU legislative actions, such as on the matter of transfer of criminal proceedings. On the other hand, the focus should be on enhancing the practical application of the mutual recognition instruments – by intensifying efforts to train judges and prosecutors, as well as by introducing the new technologies in the judicial cooperation in criminal matters procedures. In this regard, minister Toader affirmed that “in the 20 years since the Tampere European Council, some legal instruments such as the European Arrest Warrant proved to be a success story, while others have been less used. New challenges have also appeared. At EU level we will continue to focus on enhancing existing instruments by judicial training and by introducing digitalisation in judicial cooperation. Eurojust and the European Judicial Network have an important role in facilitating cooperation in criminal matters. Concurrently, new measures may be considered – some of them, concerning the transfer of proceedings in criminal matters”. The Presidency offered justice ministers the opportunity to exchange views and a way to increase, at national levels (in the private sector as well as in the civil society), the public awareness of the proposed solutions’ arguments – namely the actual protection of individuals and their rights. The ministers agreed that the proposals advanced aim to ensure that appropriate authorities can obtain electronic evidence in a cross-border context. The majority of ministers welcomed the legislative proposals on electronic evidence. In the future, they must be completed by other international instruments, considering that the issues of gathering electronic evidence cannot be solved at the EU level only. The European Commission presented the main elements of its two recommendations for the mandates to negotiate an EU-US agreement and, respectively, for the participation in the negotiations of the second Additional Protocol to the Budapest Convention on Cybercrime. Those recommendations werepublished on 5 February 2019. The Romanian Minister of Justice welcomed these developments and announced that the Presidency will propose a calendar to negotiate the two mandates – and as such, will offer the Member States the opportunity to debate these documents.